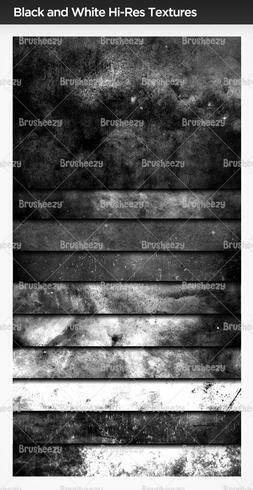 Black and White High Res Texture Brushes - Free Photoshop Brushes at Brusheezy! We know high res textures are hard to come by, so here is another huge pack of totally high resolution texture brushes. This Black and White High Res Texture Brush Pack is filled with awesome grungy brushes that will go well with tons of styles and projects. If these black and white textures aren't enough for ya, check out this <a href="http://www.brusheezy.com/Textures/11901-High-Res-Black-and-White-Grunge-Textures/premium">Black and White Texture Pack</a> right here on Brusheezy!